The approach of my birthday, Mother’s Day and making room for my son to return home from college became an occasion for reflecting on family and creativity. My twin sister Nora – of Noni Designs – and I were born at the beginning of May in 1967. Our poor mother thought she was having one big boy. Instead she got two tiny girls born six weeks early. We were incubator babies, supposed to be Gemini (the doctor predicted a delivery date of June 12) but instead born Taurus. Did that change everything? We would have been Daniel if we were a boy and Nora if a girl. So my sister, who was first, is Nora. May name Laura was hastily selected; I am named after my mother’s maternal grandmother. This is what we looked like when we were born. Nora is on the left (I think). I always look at the lips if I am in doubt. In later pictures it’s easier to tell us apart. My sister was a cherub. I often appear mischievous. In the picture below, knowing that, you can guess I am on the left. We must have been about 3. You can pick out my sister easily if you look for the cherub. She is on the right in my uncle Al’s lap (father’s brother). To the left of him is Nancy, his first wife. My mother is to Nancy’s left next to me. And I’m on my father’s lap looking sullen. I like this picture. It was taken in Boston before the family moved to Maryland when we were four. Me less intense, my sister distracted by one of my parents? I started looking at these photographs because I had to empty the beautiful creative space I made for myself and about which I wrote some months ago. The reason: Julian is returning home but I’ll tell you that story in a different post. The room was spare but full of treasures and I took my time compiling and moving, looking at each thing, letting the objects evoke past adventures, most of them with Julian. And I found an old book of photos, from which came most of the pictures here. The moment for reflecting on them was perfect because it was only days away from my sister’s and my birthday. So I thought about my sister and our mother. I thought about our father. I thought about my son and what it has been like to be his mother and to mother him differently than I was mothered, to raise him without a father. And I thought about my first knitting project, which I gave to my father. The Magic Carpet Bag is Not Flying Anywhere at the Moment . . . It takes commitment to forge a creative lifestyle that is intentional. I’ve got the creativity and a creative space. Now I need to get out the calendar and schedule the time for it. As you can see, my magic carpet bag is languishing on the sewing machine. It has clearly not received additional stiffener (several of you offered me great solutions for stiffener that I have not yet investigated . . .) nor has it received a treatment for the bag opening that will make it look more like a classic carpet bag and less like a tote. I have the purse frame I want to try. I have a strategy for shaping the opening to fit the frame. I have some types of stiffener in the studio and I have your great suggestions. And yet the project has stalled. What is going on? Why? So many reasons. And I will tell you about them so you don’t think I’m a complete slug (at least I hope not). I know many of you also have unfinished projects that you put to the side because other things demanded your attention, so I am confident most of you will understand my frustration with the stasis on the table next to the sewing machine. I, too, have had many demands on my time and attention since the last time I worked on the bag. THE TOPOGRAPHY OF AN EMPTY NEST — As you may have read in previous posts, I went on a wonderful trip to Spain with my son. We returned home on the 26th of August. We got back on a plane on the 27th and I delivered him to his dorm in San Francisco to begin his first semester (as a Sophomore; more on that in a postscript) with the help of a dear friend I have known for 16 years, but hadn’t seen for 4, and who heroically drove up from Los Angeles to fetch Julian and me from the airport and help us get his things into his new dorm apartment – which you can see below. After I got home, I lost my assistant and went back to doing everything for the domestic side of JUL myself, just as I did when I first started almost 10 years ago. WHAT HAPPENS TO THE BUSINESS WHEN MOUNTAINS START EXPLODING? — At the end of September, I went on a trip to Toronto to conduct styling parties in two stores that buy JUL from me – The Purple Purl and Spun Fibre Arts. While in Canada, I learned that Mount Agung in Bali, Indonesia – where my Balinese creative partner, Agus, and my wood and metal artisans are – was showing unusual seismic activity, a sign that it was going to erupt. The news of the eruption, which was described as imminent for some months before it actually began, terrified me for two main reasons. First, I feared for my friends and teachers because where I lived and studied during my field research in Bali is right in the exclusion zone at the base of the mountain, which is the dominant feature in the landscape in the eastern part of Bali (Karangasem). Second, I felt afraid not knowing how an eruption would affect JUL and the people in Bali who depend on JUL for their livelihoods. This story is still unfolding as the mountain has begun to erupt and ash covers the landscape in some places, has disrupted air traffic, and is having an impact on the economy resulting from a drop in tourism. Based on location, the impact of Agung on my business is minimal as Agus and my artisans are in the central south of Bali, not the east. But when the airport is closed and commerce shifts to trucks that have to leave Bali and head north to Java before they can put their loads on planes, it affects our ability to ship product with speed. MOVING — Then in October I began to pack up my studio to move my business into my house! For the months of October and November I worked on selling excess furniture and getting rid of things I no longer needed at work and at home. I packing up my living room to make way for a cutting table and leather-working space (strangely enough, I never used my living room as a social space anyway, just walked through on my way from the first to the third floor). I shifted inventory into bins and set up the computer in what had been my son’s bedroom, and before that my study (hence the built in bookcases holding all of my anthropological theory, ethnography, poetry, and art books). I shrank the physical and financial footprint of the business by shifting to a new way of storing inventory and developing a different workflow and could not be more delighted with the result. Where my studio was huge and noisy – with an illegal left turn on the corner that had people yelling obscenities at one another all day, and a fire station down the road that was engaged in mitigating tragedy and despair all day – my home is intimate and quiet, an old mill-worker house in an historic mill town right on the banks of the Patapsco River. My studio window in the back looks out on woods where all I hear are wrens bickering. My studio windows in the front look out on the river, where sometimes I see herons and bald eagles flying. This process of moving, compressing, and re-organizing the business has taken a lot of time and energy and is not only a streamlining process for JUL, but represents an opportunity for reinvention as an empty-nester for me. Here is where real honesty and openness is required. I have to confess to you that if I had truly committed to getting the Magic Carpet Bag in the air, it would be farther along by now. I have had another struggle that is harder for me than moving. I am struggling to forge a creative lifestyle. This idea might seem odd. I’m a creative person. Creativity has been part of me since I was a little girl. But the life-configuration I have now, and where creativity is located in it, needs re-assessment. I have found myself using the word ‘intentional’ lately. Maybe many of you have too. We want to be conscious of the choices we are making when we are making them and not regret an unintended life-arc in retrospect. I have had plenty of unintended life-arcs. JUL is an unintended life-arc! Here I am and I love what I am doing and want to do it better. I want to do more. I want to get the Magic Carpet Bag moving again. I want to write more. I want to be more productive in my design work. I want to work on my leather applique and return to making most of my own clothes. Intention will only get me so far. I need commitment and that is where I have been weak. I’ve been waiting for something to shape my choices – perhaps the vestiges of being a parent herding a young cat who now doesn’t need my herding. He just needs money for transport, food, and school supplies, a plane ticket home on the holidays, to borrow my car, and most of all acceptance and love and I am up to those tasks. The task that is challenging me is committing to my creative self, giving that self the opportunity, every day, to expand and take up time and space. So what makes ‘doing more’ a creative lifestyle? My uncle says it’s a matter of routine, working the activity into your daily life so that it feels as natural as getting up at 6, walking at 8, working until 12:30, then breaking for lunch. If you don’t do it something is missing and as a result your body hurts, or your mind hurts, or your heart aches for lack of work. In college, my poetry workshop leader advised us not to wait for inspiration. He said that if we were only to write poems when we were inspired, there would not be so much poetry around. Poetry is work, he said. You have to set aside time for it everyday. You write no matter what. That is intentional and committed. That is a poetic lifestyle. I have given myself the space. Now I need to give myself the time. Author Laura BellowsPosted on December 16, 2017 December 16, 2017 Categories InspirationTags Creativity, Personal history1 Comment on The Magic Carpet Bag is Not Flying Anywhere at the Moment . . . I have been confronted by a problem that has stymied me and delayed the next installment in the Magic Carpet Bag tutorial as I have been trying to figure out what to do. I finished stabilizing the textile with the muslin interlining. Following that process I stitched buckram into the bag to give it body and stiffness. When I first started, it looked like it would work brilliantly. I had pinned the buckram to the inside of the bag with safety pins, same as the muslin. Placing the carpet bag body, inside out, on a box and then safety pinning the entire layer of buckram to the bag body (excepting the bag bottom). Pinning on the box ensured that I connected the buckram to the bag body with twisting or distortion. The bag stood up on its own. Fabulous! This was the precise behavior I was going for. I then attached the buckram to the textile with long basting stitches so that the buckram and the textile would act as one piece of material in the same manner as the muslin. Basting stitches at the side seam to secure the edge of the buckram. The basting stitches are long on the interior of the bag and catch only 1 weft thread on the front of the bag so they are invisible. Basting in a zig zag covers more ground with one row of stitches. As I worked on the bag in this way I found that the buckram softened up and became more supple. When I finished, the bag no longer stood up on its own. It just slumped. I have been trying to figure out what to do about the bag’s slumping ever since inserting the buckram in order to write the next steps in the tutorial. Then a serendipitous conversation happened and a colleague to whom I was describing this dilemma asked – why not share the challenge you have encountered? It had not occurred to me to narrate the problem. I am working through this tutorial on the hoof. You are getting my process almost in real time, and that process includes this disruption in my expectations for how the Carpet Bag would work. This disruption has raised a whole series of questions for me. My first response was to think about the bag’s behavior as my failure: my approach to stiffening didn’t work. I obviously used the wrong material. What do I do now? Because I didn’t have ready answers, the Carpet Bag has languished in a soft slump. But I can tell myself a different story about the Carpet Bag and ask different questions. When the young people I work with in my studio encounter a new task demanding new skills, they have the tendency to say – “I’m no good at that. I always mess things up.” I have forbidden this script in my studio and substituted an alternative script. Instead of “I’m no good at that.” I have instructed them to say “Wow, that is a technique I have never done before. Instead of “I’m no good at that.” I have offered the alternative script “I’m looking forward to building that skill.” They won’t actually say it despite my coaxing. They’re too cool for that. But I have seen a change in attitude that I think indicates they have internalized the message that never having done something before does not constitute bad skill. It just indicates no skill yet. It indicates an exciting journey not yet begun. I now realized that, in response to my Magic Carpet Bag’s very unmagical slumping, I have been guilty of the “I’m no good at that” mindset I have tried to exorcise from my young students’ thinking. Instead, I am now choosing to see the Carpet Bag’s slump as an opportunity to think more expansively about what I expect from this bag and to respond to its characteristics in creative ways. Rather than view the bag’s behavior as my failure, I can view the bag’s behavior as an invitation to find success in an unanticipated guise. What am I going to do now? This becomes not a defeating question but an exciting one. How do I approach this design opportunity? What are my options? Which of them will I pursue? As I have begun to change my thinking, I realize that the potential next steps I have rolled around in my mind as I have looked at the Magic Carpet Slump on a daily basis are all still assuming that I am grappling with the bag’s bad behavior which I have viewed as representing my failure. In this view, slumping is bad; I need to rectify the slump with a better stiffener approach – plastic mesh, another type of synthetic, non-woven stiffener, a stiff haircell leather lining, a stiff canvas lining, boning at the side seams, cardboard in the bag bottom, etc. But what if I decide slumping is not bad? What if I decide that a soft bag is an excellent bag? What if I surrender to the characteristics of this particular textile, which is not stiff but rather heavy with beautiful drape. Upon reflection, I suspect stiffness in this bag would elude me without extreme interventions. It would get heavier and heavier as I added material to combat its resistance. It could easily become a Sisyphusean task that no one wants to live through by way of a tutorial, and I wouldn’t want to be the one to try to execute tasks the bag wouldn’t cooperate with. I don’t want to set myself up to give up. Our projects have to match us, our temperaments, our styles of learning and work. A Sisyphusean Magic Slump does not match me. The buckram, which is visible inside the bag, has given it more body and strength, but no stiffness. I began my Magic Carpet Bag project loving the social story of household use we can discern and imagine in the textile’s damage, celebrating its handmade-ness, preserving it. I carefully married the weaving to its interlining weft thread by weft thread. Adding the buckram gave it more body and strength, but not the stiffness I sought, and there my acceptance and excitement faltered. If I choose to accept the Slump’s slump and to see its heavy drape, like it’s damage, as its beauty rather than its deficit, the next step in this tutorial is a combination of two things – discernment and order of operations. I’ll save order of operations for the next tutorial and just tackle discernment here. What I mean by discernment is charting the next steps in alignment with the project’s acknowledged characteristics. What does it want to be and do, and how do I work with that as I make the next series of necessary choices – lining material, closure type, handle treatment? Given what the bag wants to be and do, what is my range of options for making it mine? Each of you, whether you are working with a handmade textile, a felted or fulled bag body, or some other found or handmade fabric out of which you have begun your Magic Carpet Bag, will need to recognize how your bag is behaving and figure out what materials and processes will work with that behavior. If you have a stiff fabric, you won’t necessarily need or want a stiff material for a lining but you may. Figure it out using visualization – imagining the bag in use, on your body, in your space – and simulation – by pinning different lining fabrics into your bag body and observing how the materials behave together and whether that behavior supports your vision. If you have a soft fabric, a stiffer lining will give it a bit more body and strength while a soft lining will retain the sensuality and hand-feel of the bag body. If your material is heavy like mine, stiffening may prove more trouble than it’s worth. If your material has alot of drape, that you really love, then choose a lining with drape rather than body so the drape of the finished bag retains the characteristics you enjoy so much. As for my Magic Carpet Bag, I’m going to take another stab at stiffener but reserve it for the bag bottom, the most vulnerable part of the textile. The buckram I put into the bag body I have not yet extended to the bag bottom. I plan to try 2 or 3 layers. I don’t expect this to give it stiffness, but rather a bit of shape and greater strength. I have also decided to try out a lining of some tightly woven, thick, unbleached canvas I have in the studio. It’s not stiff but it’s also not soft. It’s somewhere in the middle. It will not make the bag stand up. The bag will still slump. But it will be strong enough to withstand puncture by pencils or knitting needles and will not herniate in the existing areas of damage when the bag is full. You can see that the buckram I put on the bag was only wide enough for the sides of the bag. The bag bottom still needs help. What else do I already know? I will use a zipper as a closure and I plan on using two 16 inch Forager flat strap handles in the middle of the bag, one on each side of the bag opening. And I will use a Sling flat strap handle with tabs at the two ends of the bag. Here is the Sling Handle with Tabs that I want to put on the two ends of the bag at the side seams. Because the tabs straddle the side seam, I can achieve a centered handle. In what order will I do these steps? Next post – order of operations. I was in southern Spain with my son Julian for 10 days, starting on the 16th of August. My son is now 20 and I have just delivered him to the California College of the Arts. We got off the plane from Spain on the evening of the 26th and got back on a plane for California early on the 27th. With the help of a friend living in California, I moved Julian into his housing that afternoon and now I am an empty-nester. As a single mother for the entirety of his life, this represents a significant adjustment. I have no idea yet what the texture of that adjustment will be like. As a result of the timing, this trip with Julian to Spain has taken on a significance I am sure you can empathize with, even if you are not facing or have not faced this particular life-change. Image above: Julian photographing the ornamentation on a door in Alcazar in Seville, Spain. The purpose of the trip was originally just business – to hunt inspiration for new JUL designs, both knitwear jewelry and accessories as well as the new line of body jewelry I am now developing. I had to change the dates of the trip from April to August in order to participate in 10,000 Small Businesses. I invited Julian to accompany me as a way to mark his departure from my home and his entry into a new phase of his life. As Julian is an amazing young designer, (headed off to study Industrial Design), working with him on a new jewelry collection (or collections), based on Moorish architecture and ornamentation in southern Spain, was a perfect collaboration – a project we could work on together, the product(s) of which will be artifacts of this special time. You will see them in the coming year. Here are some examples of the shapes and motifs we encountered and which will be our inspiration and source material as we develop designs together. Image above: Mezquita in Cordoba, Spain. My son and I became fascinated by the Mezquita in Cordoba for several reasons. The building is massive, built on a site that had seen other religious structures for centuries. The exterior of the building is simple, high stone walls with massive reinforced doors. It looks like a fortification. The interior is astonishing. The columns and arches you see above just seem to recede to the horizon, creating a sense of magnificent, awe-inspiring infinity. The columns that you see, which at first appear uniform, are varied in material and form, the cornices sometimes corinthian, based on the curving, elegant lobed leaves of the Acanthus plant. But some of the cornices are much simpler, depicting very different carvings and motifs. This variation impressed upon us the history of cultural and religious transformations that happened on this spot, and the ancient salvaging and repurposing that happened each time there was a change. Why not use what was already there to create your own very different statement about the shape of the cosmos and the relationship between humans and the divine? Much of the ceiling in the Mosque were flat, carved and painted wood. By contrast, some parts of the ceiling opened up into astonishing and exquisitely ornate domes upon domes that are breath-taking. This combination of arches with areas of flat and carved and painted wooden panels making up the ceiling was dramatic and fascinating. The repurposing and transformation in ideas about the universe is so gloriously represented in the combination of Islamic and Christian shapes and designs in the Mezquita’s interior. How surprising and spectacular that inside the Mosque, Catholics built a church! Image above: One of the Christian areas that made up the church within the Mezquita in Cordoba, Spain. Here you see carved motifs based on the Acanthus leaf, a form that recurs in Roman, Islamic, and Christian ornament over and over. The Acanthus plant is one of those plants that has an unusual range of powerful uses for early peoples and so it shows up again and again in recognition of its potency as well as the beauty of its form. Image above: Alcazar in Seville, Spain. The Alcazar in Seville is absolutely stunning and was the first of these Moorish buildings that Julian and I visited. The scale is smaller than the Mezquita as it was a residence. Its carvings are elaborately painted as they were at the time when the palace was built. In this way the experience of the space is very different from that of the Palace of the Nazaries in the Alhambra complex in Granada where the carvings are without color. While the Palace of the Nazaries allows you to see the naked motifs clearly, the Alcazar offers a different kind of impression and visual power – inspiring with the ornamental carving, the exquisite combinations of one color and another, and color in relation to the ornaments it adorns. I just wept at its beauty and I wept at the fact that I had the precious opportunity to experience such a place with my son. The gorgeousness of these spaces is amazing and becomes even more so when you abstract the ornament using frames – as in a camera or cellphone – that isolate particular relationships between the ornamentation and architectural form. What we isolate in the frame is closer to the way we focus our eyes on specific juxtapositions we find fascinating and beautiful. And these juxtapositions are far more complex and varied, and personal, than the vistas in the photo book of the place. I discovered on this trip how similar my son’s ‘eye’ is to mine. We frequently chose the same juxtapositions to photograph, though one or the other of us might execute it better. Image above: Julian’s and my anti-selfie selfie at Medina Al Zahara, Cordoba, Spain: we are not blocking the view of the monument! Image above: Julian and me at Medina Al Zahara, Cordoba, Spain. We just can’t seem to produce a conventional selfie no matter how hard we try! Here Julian caught me rubbing my eyes. I find it funny that it looks like I am covering my eyes so as not to see something. So not the case! And we have not yet gotten to the Alhambra part of the journey . . . This plate, which you have seen over and over in my product photography, was a wedding present for my paternal grandparents and the initials are their last names joined: B&H – Bellows (grandfather Rowland) & Hammond (grandmother Emily). It is silver plate with the silver plating on the center of the dish obviously now gone. I love the contrast in textures between the center and the edges, and I love the art nouveau design of the botanical elements and how they meander over the surface of the border. It’s oval. I love that too. It is a treasure for me. I don’t know that it is valuable. 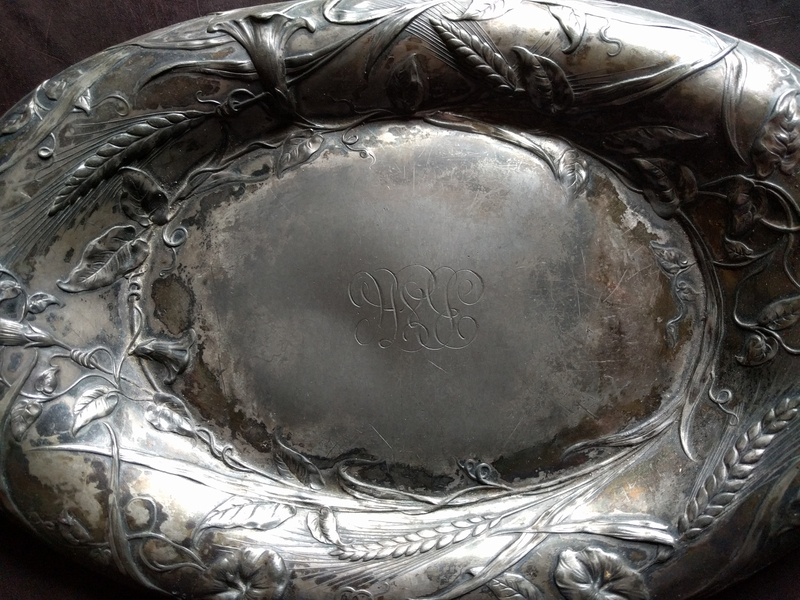 Probably it’s not as it’s not solid silver but plate with part of its plating gone. But it is one of the things I have that I really love for its combination of refined elegance and rusticity from use. It was well-loved before it ever came to me, obviously used many times. I really enjoy the evidence of the social lives of objects, their wear, their damage, their patinas and how these vestiges evoke particular pasts and unknowable moments of human interaction. I find that really beautiful. I don’t remember when this came to me. I moved many times over the years and had things packed away in storage for a long time while I was living overseas in Indonesia, then in Australia. Things stayed in storage while I lived in a small apartment before I bought my house. It’s one of those things that I feel I discovered, uncovered, like some amazing artifact from an excavation of things lost and finally found. This plate is one of those things that made me gasp when I unwrapped it and say – involuntarily in a whisper – I love this! I want to feel that way about everything I have. I want to feel that, even say it, every time I pick up the objects in my house, put the jewelry pieces on. Objects can carry quiet, gorgeous, recollections that flit across the mind daily and almost unnoticed every time we touch them, see them, like the shadows of birds flying over us.